As the store designer I will work with you to create one of the most special keepsakes you can give to your children, siblings, or family members - their ancestry information - their roots. They say that “the apple does not fall to far from the tree” and in this photo tree design we use that saying to create a magical, stylish family photo tree that can be displayed in any room of the house! I can design this for one child or multiple children as shown in examples 1 & 2 of the product listings. 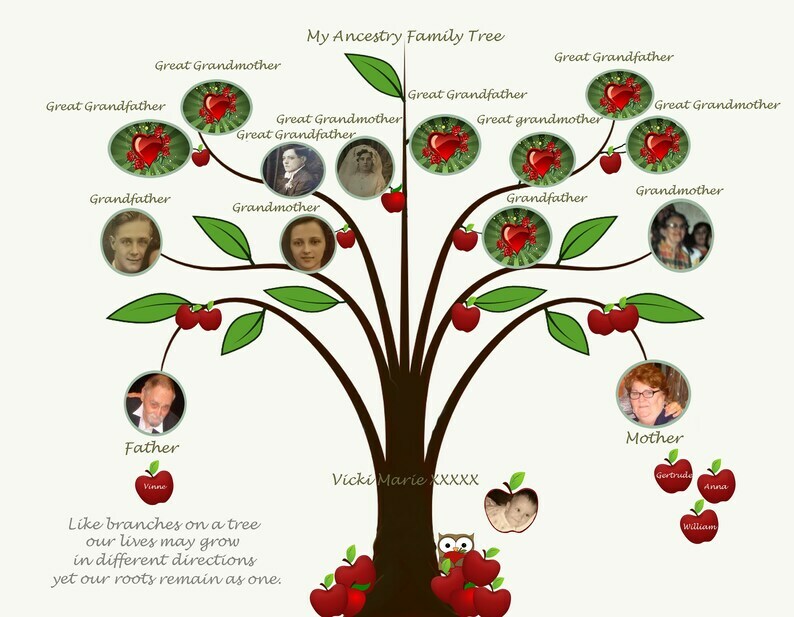 We can design 4th and 5th generation family trees. If you do not have a picture of your family member we will add the heart marker as shown in this example in place of their photo along with their first and last name. As your children grow there is tremendous value and meaningfulness in understanding who their grandparents and great grandparents are or had been while living. This can lead them to even deeper discoveries into their family heritage because you have taken the very first special steps to preserve it for them. This is a conversation piece that will afford you and your children as well as other family members the opportunity to discuss deceased loved ones and reminisce on fond memories with those who are still living. What a great gift idea! Why not give something meaningful and unique? (If you would like to purchase a gift certificate please call us at 302 892 2572 so that we can create a personalized gift certificate for your recipient) We keep a file of all gift certificates purchased and there is no expiration date, so the recipient has plenty of time to gather their family photos and information to then redeem their gift certificate! This listing is for a DIGITAL File only. Digital Files are great as they enable you to print how and as many times as you like. They also ship for free! You can then either print online, or from a print store. When your digital photo gift is complete we will send you 2 files along with our permission to print. Our standard digital size print template is 10 x 8 portrait. However as mentioned we will provide you with 2 digital file sizes, the 8 x 10 and 14 x 11 at no additional charge, so you have the option to print either size. Please note that the initial image available directly after the time of purchase for download is not the final product. it is simply an example and marker. You will receive your personal draft proof and final product via email once it is complete and this usually takes 2 - 3 weeks to complete. Included in the purchase are up to three amendments should you feel any changes are needed. Perhaps you have changed your mind on photo choices, and would like to add a different one to the Ancestry Family Photo Tree or you would like the font or background to be a different color. Any additional change request will cost $7.50 each. ***Please note that I will maintain a editable file for you and hold for 5 years, so that if you have additional children we can add them onto Ancestry digital family photo tree footprint at a small fee of $10.00 per child. Once your child is added I will send you the digital file for you to print as desired. When the time comes for this addition, simply email us at absoluteinspirations [!at] gmail.com and we will invoice you and then work with you to capture your photograph and place it digitally upon your ancestry tree! At the time of purchase select your background and let us know if this is for one child or multiple siblings and provide us with a good contact number. You can do this in the comment section or custom request section when placing your order. Once our designer has your photos and your completed Ancestry Form they will begin to create your personalized Ancestry Family Photo Tree.This process usually takes 2-3 weeks. *You will be sent a digital proof for your review. As indicated within our listing, you can amend up to three times should you feel any changes are needed, such as font color change, background color change or perhaps you have found a different photo that you would like to add in place of one you sent previously. If you have a deadline please let me know and we will do my utmost to meet your timescale.